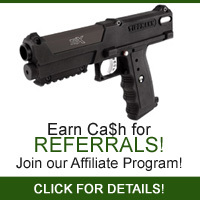 Are You Looking For A Tippmann TPX Pistol? We Have Tippman Painball Guns! You don’t have to be an expert in the sport of paintball to know that Tippmann paintball guns are among the best in the industry. Since launching its first guns in 1986, Tippmann has quickly built a reputation for unrivaled quality and innovative design. In fact, Tippmann paintball guns are backed by a comprehensive two-year warranty. It is for these reasons and more that Red Dot Paintball is proud to be a Tippmann supplier, as well as a Tippmann Certified Tech Center. From the Tippmann TPX pistol to the Tippmann Gryphon, you will find it all at Red Dot Paintball. We sell and service Tippmann. And thanks to our low prices and price match guarantee, you can rest assured you will never pay more than necessary when you buy paintball guns and supplies from Red Dot Paintball. Before your next paintball match, visit our home page to see the killer paintball gear that is waiting for you at RedDotPaintball.com!